Many people are surprised to hear me (and my staff) say that we do not allow rawhide chews, pig's ears, bully sticks, and other "animal parts" in our facility. Let me explain exactly why we feel so strongly about these types of chews, and particularly rawhide chews. But let's begin by providing an alternative to these chews, first: Marrow bones are a wonderful alternative to rawhide and animal parts, and they are much better for your dog's teeth and digestive tract! I have personally seen this occur several times with my own dogs, before I banned the use of rawhide in my home. The dog is just gnawing away at his rawhide chew when suddenly...gulp...ack...ack! Dogs enjoy these chews so much that they will often work really hard gnawing at a single piece, until they dislodge it from the bone and then, yep...they actually try to swallow it whole! If you have never seen this happen, it is super scary! You literally have such a short time to dislodge that chew from the back of their throat before the dog either attempts to swallow it down further, or it actually cuts off your dog's airway. If your dog swallows large enough pieces of rawhide, the rawhide can get stuck in the esophagus or other parts of the digestive tract. Depending on its size and where it is located, a vet might be able to remove these pieces by going in through the throat. But sometimes, abdominal surgery is needed to remove them from the stomach or intestines. If it isn’t resolved, a blockage can lead to death. Aggression & Resource Guarding: If the choking hazard wasn't bad enough, giving a rawhide or other animal-based chew to a dog can incite aggression. Whether that aggression comes from the dog chewing the bone who is guarding his resource, or from another dog in some adjacent space, many a scuffle has occurred in multi-dog households because one dog thought he should protect what was his, while his housemate thought he should have all the bones! We have even seen dogs protect their rawhides from a dog across the hall or from he dog'd owner, who provided the chew in the first place...to solve that problem, no more rawhides for that dog...ever! Irritation of the Digestive Tract: Some dogs are sensitive, or more likely, allergic to rawhide or other substances used in their manufacture. This can cause some big problems, diarrhea and vomiting among them. 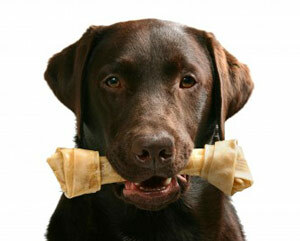 Chemical Exposure & Contamination: Rawhide chews can contain trace amounts of toxic chemicals. And of course, bacterial contamination is always a risk when dealing with non-human-grade manufacturing. Did You Know? Humans can be at risk when coming into contact with Salmonella or E. coli contamination bacteria on rawhide treats. Whenever you see the words, "wash your hands thoroughly after handling these treats. Have young children and family members with immune system problems avoid handling them at all..." you have got to start wondering, "Why on earth would I allow my dog to consume it, if my children are at risk by just touching it?!?" Now for the gross part...did you know? Rawhide treats come from the inner layer of cow or horse hides.